It has been some time since I have highlighted new produce from my visits to the organic farmers’ market at the Placita Roosevelt in Hato Rey, a San Juan neighborhood. Amidst the usual mixed greens, radishes, and herbs laid a different treat I couldn’t resist buying. These are nasturtium (tropaelolum). Sweet and peppery, the whole plant is edible: leaves, stems, and flowers. The leaves are especially delicious when combined with other milder greens. Their seeds can be pickled and eaten like capers too! 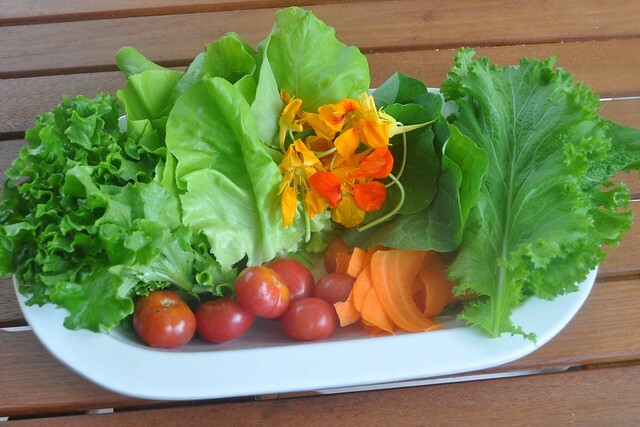 Market salad with curly leaf lettuce, bibb lettuce, nasturtium leaves and flowers, and mustard greens. In addition to the greens and nastortium, we bought another bunch of carrots, eggplant, broccoli, a big bunch of cilantro, and two pounds of mixed tomatoes. 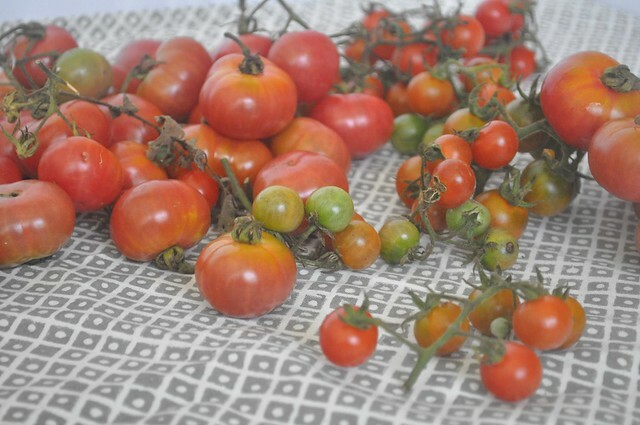 The ripe tiny ones are almost like candy: all the sweetness, but none of the guilt. Are farmers’ markets already open where you live? What is your favorite produce in season right now? Remember that the organic farmers market at la Placita Roosevelt fills up with vendors on the first and third Sundays of the month. 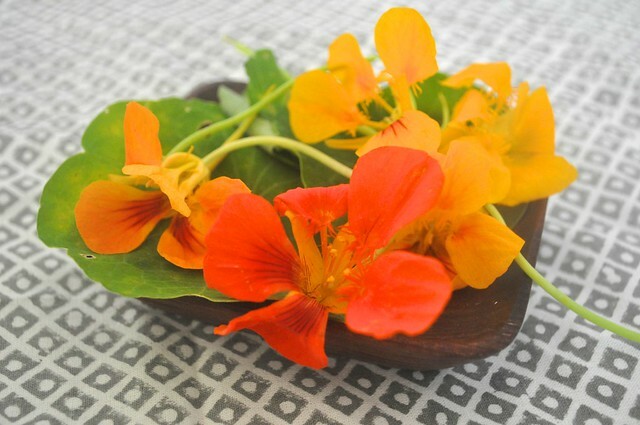 I love the peppery bite of nasturtium blossoms in salad. I am so jealous right now. The farmers markets here don’t open until late May. A lot of the produce you’re getting now won’t be available (as local) until July or August. Spring, go faster, please! It was my first time having them and I loved them. I might plant some soon, especially since they seem to be easy to grow. Ooh, I’m so jealous that your farmers market is up and running. Chicago has to wait till late May. Even though it feels like summer here it will be some time before we have a local farmers market…beautiful! Qué rico! Las voy a buscar! Thanks for sharing!